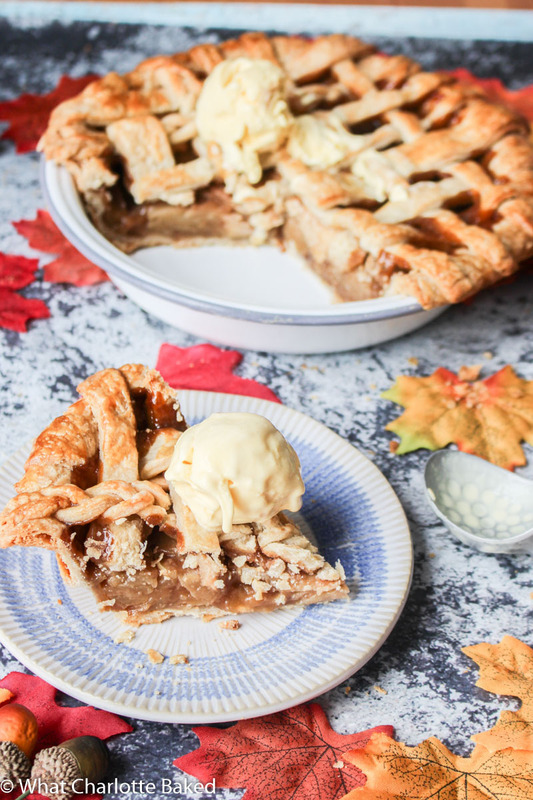 It’s Sunday afternoon (for me anyway) and whilst I sit here and wait for Amazon to bring me my new Nintendo Switch, I thought it was about time I got around to sharing this absolutely gorgeous Maple Apple Pie I made a few weekends ago. This might actually be the best thing I’ve ever made. I’m so proud of how it turned out! 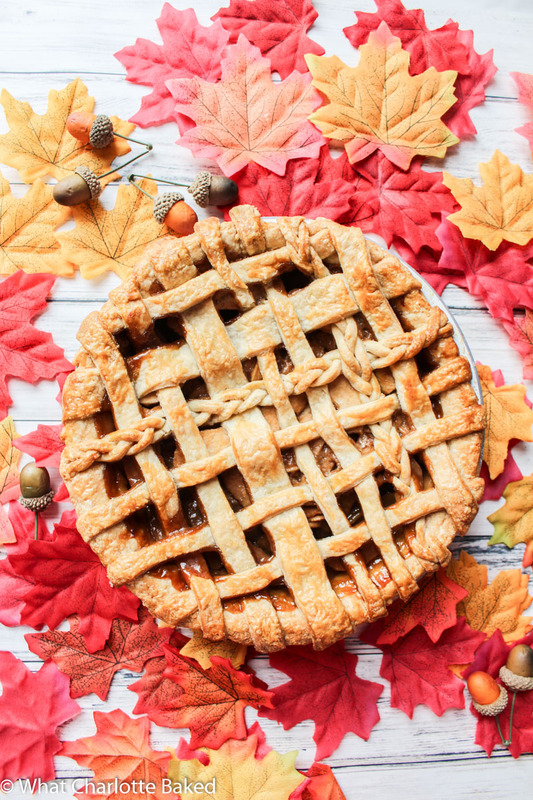 Yep, a lattice maple apple pie on a background of autumnal red and orange leaves is where it’s at. Where do I even begin with this one? I’m not a massive pie baker, and this is the first time a pie I’ve made has been deemed worthy of being shared on the blog. Pastry scares me (a lot) and I’ve tended to get some major pastry shrinkage in the past, which has really put me off TBH. But, I think I’ve finally cracked the key to a perfect flaky pastry crust – I did all the trial, error, and hard work, so you don’t have to. I’m just so nice like that. There are two important rules to remember when making a flaky pastry crust. Firstly, keep the pastry cold. You need to use chilled butter and shortening, as well as cold cold cold water. Try and keep your hands out of the equation as much as possible, as we’re all little heaters when it comes to pastry. The colder the pastry, the less the butter will melt, and the more flaky layers you will end up with. Got it?
) when cutting the butter into the flour, but you can also use a food processor (not a stand mixer) if you have one. And if you have neither of these things, then two metal forks will work too.
) then it’s time to get filling the thing. 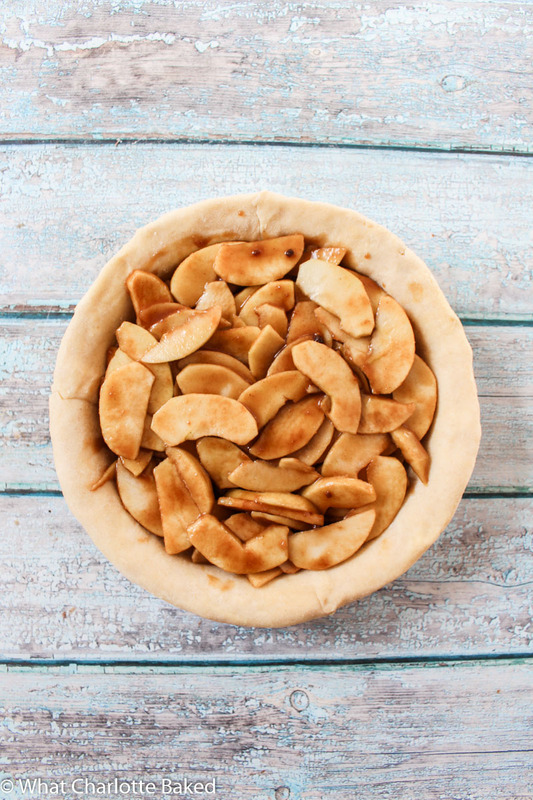 Peeling, coring, and chopping the Granny Smith apples into slices is the most time consuming bit of the whole pie process, but you do need to make sure you take the time to get the apple slices all of a similar thickness. If you don’t, then you’ll end up with bits that are more cooked than others. The apples are coated in a mixture of melted butter, maple syrup, sugar, and some spices, as well as a little bit of flour to help keep things less watery. Once you’ve spooned the apple slices into the pie case, don’t pour the remaining juices in on top, however much you want to. This will add unnecessary liquid to the pie, and you don’t want to end up with a soggy bottom. Look at that gorgeous lattice work! I can’t quite believe I made it ? 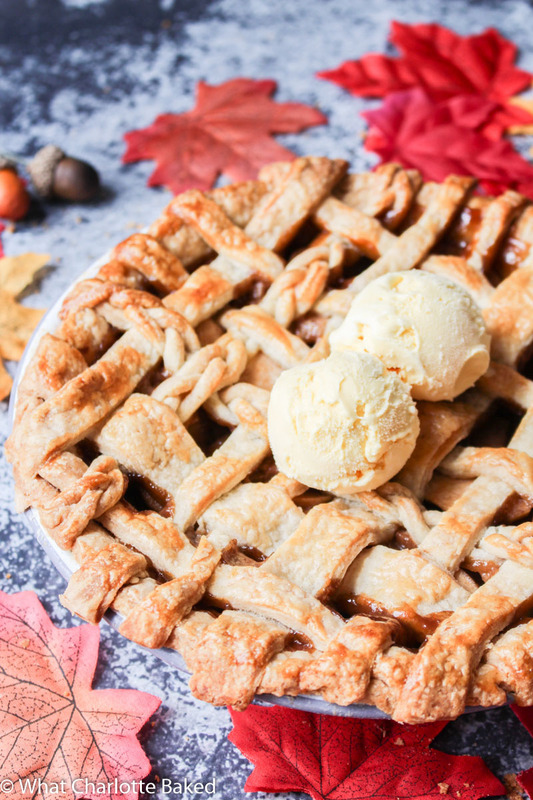 As it turns out, getting a beautiful lattice top to your maple apple pie isn’t as difficult as it looks. Thank god. This video will show you how easy it really is. I added a couple of thicker strips to give it a bit of variation, as well as those lush plaits. To make those, just cut three really thin strips of pastry, and pinch them all together at the top. Gently plait them together, like you would hair, making sure to try and not break any of the strips. Once you’ve plaited all the way down, pinch the ends together like you did at the top, and then add it to your pie just like the rest of the strips. Make sure to press the ends of the strips down onto the edge of the pie so that they stay in place in the oven! I put the pie back in the fridge for half an hour after assembling, to give the pastry the time to rest and chill a little. This is when you need to preheat the oven ready for baking. The pie will go in at a slightly hotter temperature, and then after 20 minutes, you need to remember to reduce it down slightly. The details are all in the recipe below, but just make sure you don’t leave it baking at 200°C for the whole hour! And there you have it, an (almost) perfect maple apple pie. Vanilla ice cream always goes down well with a warm bowl of apple pie, and so that’s my recommendation. Of course, if you’re more of a custard or cream girl, then fill your boots. The faux acorns and leaves are optional. Still no Nintendo Switch though. Come on Amazon! I need to get my Mario Kart on. Flaky homemade pastry filled with soft apples with a hint of maple syrup. The best dessert for autumn evenings, especially if served with vanilla ice cream. Place the flour, salt, and sugar into a large bowl (or the bowl of a food processor) and mix together. Cube the cold butter and vegetable shortening and place into the bowl. Use a pastry blender or two forks to cut the butter and shortening into the flour, or if using a food processor, pulse about 10 times. You are aiming for the bits of butter to be pea-sized - these small lumps of butter will help make the pastry flaky. Add the water to the bowl a couple tablespoons at a time, mixing together between additions. Once the dough forms a nice ball, and seems wet enough without being too wet, turn it out onto a floured surface and knead gently into a ball. Cut the dough in half and shape each half into a disk. Wrap each half in cling film or plastic wrap and put in the fridge to chill for a couple of hours. Peel and core the apples, and then slice thinly. Place in a large bowl and set aside. Place the sugar, butter, maple syrup, cinnamon, ginger, and flour into a saucepan and heat on medium, stirring occasionally, until the butter has melted. Pour over the sliced apples, and toss together to evenly coat. Set aside. Remove the first pastry disk from the fridge and roll out on a floured surface, turning every so often, until you have a circle big enough to cover the bottom and sides of a 9 inch circular pie dish. Gently transfer to your pie dish (I use my rolling pin to do this) and then gently guide the pastry so that it is nicely covering the pie dish, without any stretching, and so there is a slight overhang on all the edges. Trim the edges, leaving a little extra pastry in case of any shrinkage in the oven. Spoon the apple filling into the pie case, and then discard any leftover juices at the bottom of the bowl. Fill the pastry case right up to the top, as the apples will shrink in size slightly during the baking process. Set aside. Roll out the second disk of pastry as before. Using a sharp knife or pizza wheel, cut strips of pastry in various widths. To make plaits, cut three very thin strips and press them together at the top. Gently plait together, and then press together at the bottom. 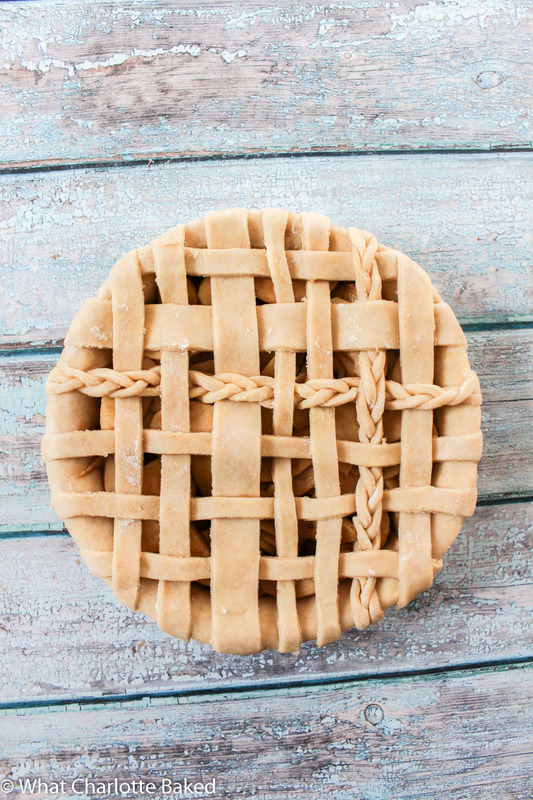 Place the lattice strips onto the pie, threading over and under each other, and pressing the ends of all the strips onto the edges of the pie crust to keep them in place. Place the pie into the fridge whilst the oven warms up. Preheat the oven to 200°C / 390°F (180°C fan). After half an hour or so, remove the pie from the fridge and brush the pastry lattice generously with the beaten egg. Bake for 20 minutes, and then reduce the temperature down to 190°C / 375°F (170°C) for the remaining 40-45 minutes. Keep an eye on the pie, and if the top or edges look to be getting too brown, then cover with aluminium foil. Once the pie has finished baking, leave to cool in the pie dish on a wire rack. Leave the pie to sit for a couple of hours before eating, so make sure the juices inside settle. You can eat the pie cold, or alternatively, cover in foil and pop back in the oven for 15-20 minutes at 190°C / 375°F (170°C). Serve with custard or vanilla ice cream (my favourite). The baked pie will stay fresh for a couple of days if covered and stored in the fridge. You can make the pastry ahead of time and keep in the fridge (covered in clingfilm) for 4-5 days. The baked pie can be frozen - cover with foil or place in a large sandwich bag, and freeze for up to 3 months. To defrost, place in the fridge overnight and then reheat as per the instructions in the recipe above. This pie was a triumph! And very autumnal, Or Fally if you prefer.